How to Do Images posting in SEO for Back link ? Hi, welcome back to our blog we are continually trying to post new post to share our knowledge with you, image optimization in seo , we are focusing on SEO topic and we share all type of SEO technique and there doing the step with our articles. 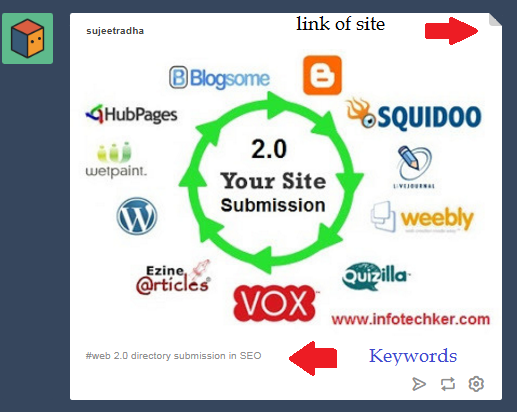 now in that post, we tell you about Images Posting In seo technique and it Benefits in SEO. Image posting in seo is the process that can he help to increase your website back link with the help of images. Most of the website like Instagram, Tumbler, Pinterest, Flicker that one of the top website for sharing images. With your Keyword, Description, and link, in image posting submission we post our High-quality Images and most important unique self-created do not post other copy right images. You create your own images in Photoshop and MS Pent or other software that you like to use. There are thousands of website to post your images posting you can simply visit and create the account and post your free images. For Images posting in seo, you have to Go to Google and search free images posting the website you can find thousand of a website. >> click on top bar New Post Section and select “Upload Images ” Option and upload your Images on your Computer you can post the link also to your images that already hosted on your website. Add the title of your image in first just like we added and footer section you can add your images discretion with your keyword. See the right side there is the “Tag” option in that section you can add your website keyword, keyword help to find your images on this site any one can find in their search box. All ok click to share images and your images have been shared it. See the most viral images section to find your images. go http://www.pinterest.com/ and create the account or log in and go to profile section or save option in top menu bar.for Pinterest posting images you can first create the board like images posting in seo etc. as you like to name and save it. Second step you can add to your computer or post like your images that were hosted on your website or another website. 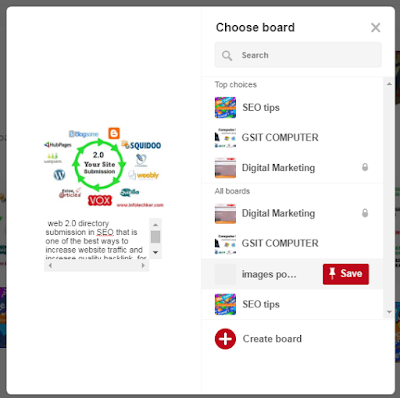 Add Images you see something like add your image Distribution in a footer and click to read button “Save” on your board and click to “see it now “ button. Now just click to edit option to your pin and add your website or landing page URL and save it. For testing, you can click to your pin redirect to your website. I mean you can get a back link throw your posting images . Go to http://www.tumblr.com/ and login or register tumbler is the social bookmarking website and also free blogging website. 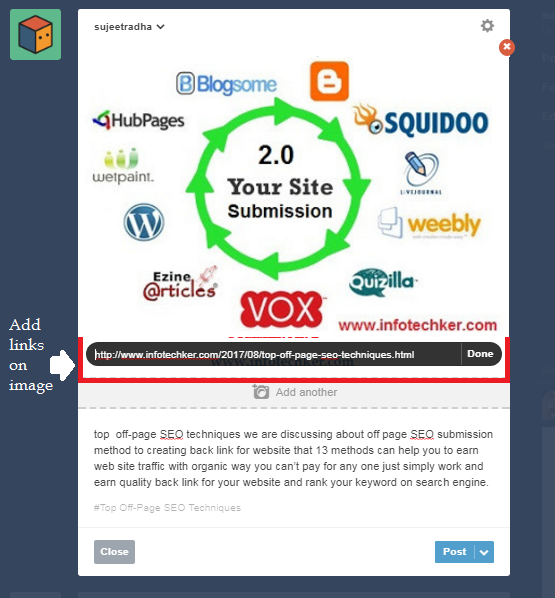 tumbler provide text, Images, Videos, Link, Quote, etc share option in that example we can use images sharing option of the tumbler to get Back link. Personally, I love tumbler for social Bookmarking and images posting in seo website, so let’s start the post your images click on “Photo” option you select “photo” Option then you have added link on images other option like text share there, you can add images but do not add “link” on images . Click to photo select your images or you can post the link also, then your images are added move your mouse over to the footer and see there is link option on images click to option and add your website link just we show in images and click to one option. You can also add images descriptions with highlight keyword and add the link on selected keyword. Use # tag and your Keyword for a focus of SEO just we show in images and post it. If you post your images you can see it on live work “link of a site” we give arrow there any one can move the mouse or click the images they redirect to your website or landing page that you add before publishing images on tumbler. There some example we do for images posting you can practice more website with Different images and post it, Instagram, Flickr, like a website. We some list of images sharing the website you can follow that post your images and get back link to your website. Some website gives back link and some not, better idea you can add text on images of your website name like www.infotechker.com for user aware your website and they find on Google. Conclusion: images is the key of content you can add creative images that are definitely help to move user to your website to business images posting in SEO that is the part of getting quality back link with use of images created by you and post to various free images posting website , creativity is impotent to create images you can use Photoshop or other tools for creating info graphic images, Banner and post it to various website and earn organic traffic to your website. Thanks for sharing this informative blog. I found very interesting stuff on this site.